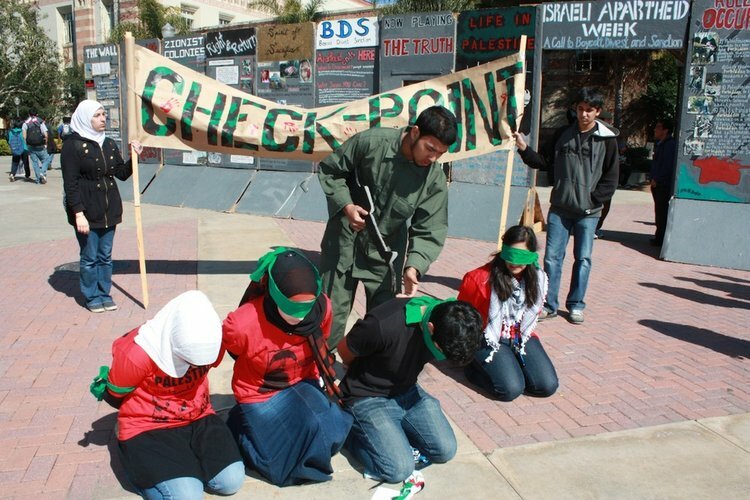 A mock Israeli checkpoint set up during “Israeli Apartheid Week” on the campus of University of California, Los Angeles. Credit: AMCHA Initiative. (JNS) — You send your kids off to college, and they come back telling you that Israel is an occupying force with no rights to the land. This Jewish state you taught them to love? Their professors and friends have convinced them that it’s nothing more than a Zionist hoax. Not surprising is a recent Anti-Defamation League study that found that incidents of anti-Semitism on campus have nearly doubled over the past year. And a recent study by Brand Israel found that support by American Jewish college students (62 percent who had witnessed anti-Israel activity on their campuses) for Israel plummeted from 84 percent to 57 percent between 2010 and 2016. But despite years spent in front of “left-leaning professors,” Forer emerged with her love of Israel forged in the fire of anti-Israel pressures. As the campus’ StandWithUs Emerson fellow and president of the pro-Israel group Tikvah, leading pro-Israel counter-demonstrations became a defining piece of Forer’s college experience. But hers isn’t necessarily typical. • The UCLA student government debated whether representatives who went on trips to Israel sponsored by Jewish groups should face sanctions. This following on the heels of student government leaders raising doubts about whether a student can sit on a campus judicial panel because he or she is Jewish. • On the eve of the Passover holiday, when most Jewish representatives had left campus and were unable to vote, the Students for Justice in Palestine (SJP) chapter at Tufts, working with the campus Jewish Voice for Peace (JVP), put up a surprise BDS resolution calling on the university to divest from companies that do business with Israel. • At New York University, SJP and JVP convinced 53 student groups, including the Slam! Poetry Club, to sign on to support BDS, and refuse to co-sponsor events with any Israel advocacy and Jewish groups. This coalition is an example of “intersectionality,” where seemingly unconnected groups — often Hispanics, blacks and gays and lesbians — are being solicited as allies of campus anti-Israel groups. Forer, the UC Berkeley grad, said such “intersectionality” is a fact of campus life today. “Anti-Israel forces are becoming more strategic by hijacking other minority groups and convincing them that they’re all victims,” she says. Behind much of these on-campus attacks on Israel are student groups that have increased their numbers in chapters across North America. Not only have INN chapters organized “anti-occupation Passover Seders,” but they have been targeting younger Jews this summer, holding training sessions for camp counselors working at eight Jewish camps to teach “anti-occupation” propaganda to their campers. One suggestion: leading the Kaddish mourning prayer for Palestinian terrorists killed in Gaza. This summer, IfNotNow also set up a table marked “Birthright” at New York’s John F. Kennedy International Airport to pull over travelers to Israel on Birthright Israel to warn them of “the truth” about the country they were about to visit, most of them for the first time. In addition, five members of IfNotNow made a highly publicized walk-off from the last day of their own Birthright trip to join with the anti-Israel group Breaking the Silence, so they could “learn about the occupation,” they said. That positioning “masquerades as pro-Israel and pro-peace so it can pull students in, often funneling them onto the more violent JVP,” said CAMERA’s Levin. Back on campus, insisting that schools “boycott, divest and sanction” Israel remains the No. 1 method of fomenting an anti-Israel student body. Since the time of the Second Intifada in Israel in the early 2000s, anti-Israel forces have been pressuring local governments, unions and churches to divest of any financial connection to Israel and its businesses, hospitals and universities. On campuses, this means getting the school government to pass these resolutions, which, in turn, pressure their administrations to adopt them. The Jewish Virtual Library has tallied 119 BDS votes in the past five years. Though 64 percent were defeated, BDS has passed at many institutions of higher education, including the universities of Michigan and Minnesota, George Washington University, Oberlin and Barnard colleges, and several University of California system branches. An AMCHA study shows that schools that even consider BDS resolutions witness an uptick in anti-Semitic events. At UC Santa Barbara, for example, Jewish students were threatened, and a student wearing a Star of David necklace spit on. The vote there on BDS was by secret ballot. “That means representatives aren’t accountable to the students who elect them,” Pessin said. The student anti-Israel groups, however, are not operating without help from their elders. In fact, nearly 2,000 faculty members across North America have endorsed a BDS agreement to boycott Israeli institutions and refuse to write recommendations for students wishing to study there. This is according to Tammi Rossman-Benjamin, who taught Hebrew and Middle East studies at UC Santa Cruz for two decades and is executive director of AMCHA Initiative, which monitors the situation. Pushing the dial even further to the left are the many schools where the salaries of professors of Middle Eastern studies are being paid by endowed chairs that bring millions into universities’ coffers. Many of these endowments are by wealthy Arabs and Arab-sympathizers. Among these is Prince Alwaleed bin Talal Alsaud, the fifth wealthiest person in the world. Although the Saudi’s $10 million for the Twin Towers Fund was refused by New York City Mayor Rudolph Giuliani after the 9/11 attacks, no such rebuff greeted the prince’s $20 million endowments to both Harvard and Georgetown universities. Another example: Both NYU and Columbia now have Hagop Kevorkian chairs paid for by that Armenian’s millions. And, as they use their lecterns as anti-Israel bully pulpits, professors can punish any student who speaks in Israel’s defense. None of these anti-Israel programs comes cheap. And, observers say, American laws governing non-governmental organizations (NGOs) and other nonprofits often protect the groups from transparency in their funding streams. In the United States, the Rockefeller Brothers Fund supports everything from BDS campaigns and anti-Israel lobbying to NGOs funding anti-Israel activities. Among its campus grantees are JVP ($280,000), Palestine Legal ($150,000) and the U.S. Campaign for Palestinian Rights ($90,000). “There’s an alarming drop in federal prosecutions of terror finance activity in the charitable sector,” says Jonathan Schanzer, a former terrorism finance analyst for the U.S. Department of the Treasury, now with the Foundation for Defense of Democracies, who testified before Congress. Umbrella groups that help fund the anti-Israel forces in North America include the U.S. Campaign for Palestinian Rights (previously known as the U.S. Campaign to End the Israeli Occupation), which is a major enabler supporting BDS campaigns on a multitude of campuses. Also known as Education for Just Peace in the Middle East, it has a hand in more than 300 BDS organizations. In addition, those involved in charities that were connected with or found guilty in American courts of terrorist activities have now regrouped as the American Muslims for Palestine (AMP), Schanzer said. The AMP specifically helps SJP run BDS campaigns and has supplied chapters with such resources as “Apartheid Walls” for Israeli Apartheid Weeks. As a not-for-profit corporation with 501(c)(3) tax-exempt status, Schanzer told JNS that “AMP would not have to file an IRS 990 form that would make its finances more transparent” and can receive tax-exempt donations. Of course, not all universities are equally embroiled in anti-Israel activities. Lists of those with the greatest number of incidents and overtly anti-Israel professors tend to include such schools as Columbia, Portland State, San Francisco State, UCLA and Vassar. School is now back in session, and many observers expect anti-Israel forces will keep cranking up the heat.